Altered clipboards are a great gift for kids. They are inexpensive and fun to make. All the kids I have made them for love them. Supplies needed: Clipboard, ModPodge (comes in glossy or matte, I prefer matte), paper and/or paint, stamps and/or embellishments, fibers/ribbon, exacto knife, and a pen. A brayer is helpful but not required. 1. Sometimes the top clip on the clipboard will screw off. If it does, take it off for easier decorating. If not, you can work around it by planning a design where you paint the top part and/or have a straight paper line. 2. 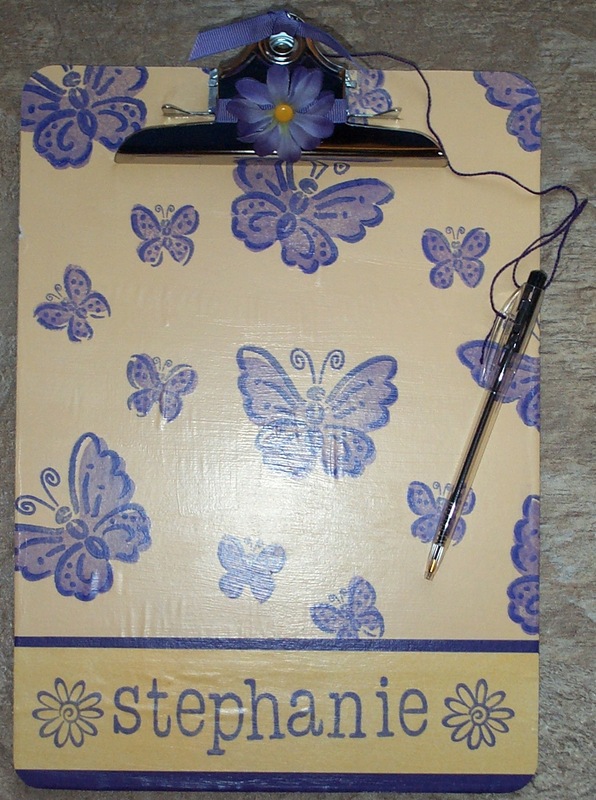 Chose papers, colors, and embellishments for your clipboard. Make a rough draft drawing or have a design idea in your head. When chosing a design, remember to keep the majority of the main surface flat because it will be used for writing. Because of this stamping is a great choice of embellishing. Keep stickers in the corners. 3. Any areas that will be painted should be done first. I like to paint the side/edge of the clipboard for a more finished look. 4. Next cover with your chosen paper. Use the Mod Podge as your adhesive, applying a thin coate to the clipboard. Use a foam brush for complete coverage and don’t worry applying the Mod Podge beyond where you are placing the paper. Place the paper on the clipboard and use a brayer to roll over the top of the paper so that it is secure. Let dry. 5. Flip the clipboard over and using the exacto knife, trim the paper around the clipboard. 6. Stamp, embellish as desired. Mod Podge works well as an adhesive for diecuts and paper flowers like in my examples. 8. 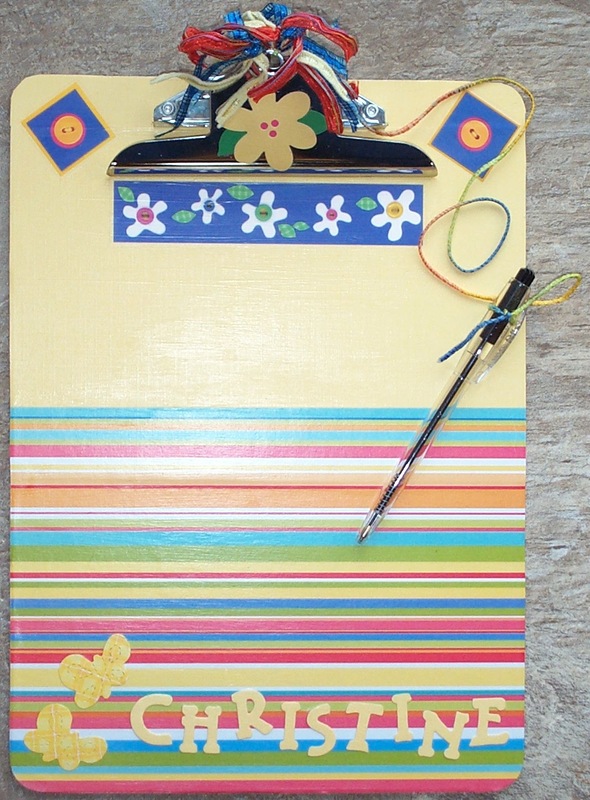 Use ribbon or fiber to tie a pen to the clipboard. Make sure it is long enough for comfortable writing. Tip: To avoid bubbles when using Mod Podge (as shown on Stephanie’s clipboard) remember two things. 1) Use thing coats. Don’t worry – It will stick and too much is not a good thing. 2) Give plenty of drying time between coats, especially when you’ve used it as an adhesive underneath and before applying the top protective coat. If you do get a small bubble, you can try to roll it out with the brayer. If that doesn’t work just leave it. You will do more damage than good and the great news is that I have had this happen and after it dries the bubble disappears!